Made with three carefully-selected varieties of cheese: Emmental, Gouda Gold, and Mozzarella. Made using a mild white sauce so as to enhance the flavors of the cheeses. Simply defrost the pizza either in the refrigerator or at room temperature, then bake in an oven or toaster oven and enjoy. Each pizza is 207g and approximately 19cm in diameter, and arrives frozen. 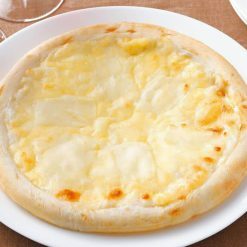 This pizza was made with three carefully-selected varieties of cheese: Emmental, Gouda Gold, and Mozzarella. Emmental cheese has a unique, nutty and savory fragrance. Its flavor has a sweetness to it. Gouda Gold cheese has a flavor and a depth born of its aging process that give it an especially rich flavor. 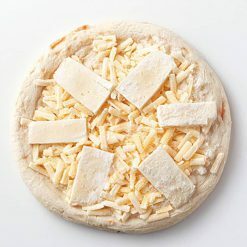 For this pizza we used a Mozzarella that has less water content than ordinary Mozzarella, making it strong and milky. In order to enhance the flavors of the cheeses, we used a mild white sauce (one of our menu items) as a base. The outside of the crust is crispy, and the inside has a nice springy texture. The pizza is approximately 19cm in diameter, and is the perfect size for a couple to share. The pizza can be placed in the refrigerator and will defrost in about 8 hours. Alternatively, it can be defrosted at room temperature in 1 to 2 hours. To bake the pizza using an oven, first preheat the oven to 250℃. Remove the film and cardboard from the defrosted pizza, place the pizza on a baking tray, and bake it for about 6 minutes at 250℃. To bake the pizza using a 1000W toaster oven, remove the film and cardboard from the defrosted pizza and bake it for about 5 minutes. Once the pizza has been baked, you can add your favorite toppings and seasonings. Some ideas for toppings and seasonings include lots of coarsely ground black pepper, pure acacia honey (item #6286), fresh pesto (item #5726), or dry economical crepes (item 791) paired with thin, chopped green spring onion shoots. Always defrost the pizza before baking. When the cheese melts and grill marks are visible on the entire surface of the pizza, it is finished baking. Baking times will vary depending on the oven used. Please adjust accordingly. Will be extremely hot after baking. Please use caution to avoid burns. This product contains pizza crust (wheat flour, rapeseed oil, yeast, table salt, sugar, malt), natural cheese, white sauce (wheat flour, cream, onions, rapeseed oil, whole milk powder, butter, sugar, chicken extract, cornstarch, table salt, powdered nonfat milk, yeast extract, spices), (contains chicken meat). This product is not suitable for anyone with allergies to milk, wheat or chicken.